Simply tell us about your project below, and one of our web wizards will be in touch within 24 hours! If forms aren't your style, no problems! please contact us via this form to schedule a call-back. We respect your privacy and will not call without your permission. Please indicate your prefered date/s and times for a call-back below. We'll do our best to accommodate your request! Your business is your passion, so stop struggling with a lack of sales, fruitless marketing campaigns, and unqualified leads. As a leading Perth web design studio, we have a deep understanding of the unique challenges facing you and your company in the digital landscape. We offer three comprehensive web design packages that provide you with everything you need to get your professional website up and running, and fully customized according to your goals as a sole trader or small business. Can't find what you need? No problem! We also offer custom ecommerce, mobile, and web app development solutions for small businesess looking for the ultimate in bespoke digital capabilities. Whether you’re a sole trader looking to broaden your client base by optimizing your online presence, or a small business looking to increase sales and reach more customers; we guarantee that we have the right web design package for you! Perfect for sole-traders, tradespeople, consultants and small businesses looking to showcase their portfolio or services. Get ahead of the competition, land more clients, and grow your business! Our 'Pay Monthly' option means you simply pay one all-inclusive monthly rate for your website services, just like your phone plan! Cancel anytime! No lock-in contracts, no strings attached. Monthly hosting & maintenance packages are included free in all pay-monthly plans! See our FAQ page for more info. Included free with monthly billing option. Allows for easy website editing , management, and indexing of content, all without hiring a developer! - Monthly updates and maintenance. Leave the tech stuff to us while you focus on what you do best! Our 'Pay Monthly' option means you simply pay one all-inclusive monthly rate for your website services, just like your phone plan! Cancel anytime! No lock-in contracts, no strings attached. Monthly hosting & maintenance packages are included free in all pay-monthly plans! See our FAQ page for more info.See our FAQ page for more info. Update and manage blog content, image collections and portfolio items at the click of a button! Edit your own website at the click of a button - No tech skills needed! Track visitors to your website, and receive user insights at your fingertips! Whether you have one product, or one thousand: SunSeeker Studios deliver one-of-a-kind ecommerce solutions that get results! Launch your own ecommerce store today! Update and manage products, blog content, image collections and portfolio items at the click of a button! So your website Looks amazing on any device! Track visitors to your store, see which products are selling, and receive marketing insights at your fingertips! Stay on top of your inventory, track sales, and manage stock at the click of a button! Allow your customers to calulate their shipping rates in-store! Manage your store, track your sales, and take control! We provide 1 hour of comprehensive training to ensure you know your store inside-out! If you're handling sensitve data such as credit card information, you need the best when it comes to data security. Rest easy knowing you're protecting your clients data. 1hr (60min) per month allocated website design changes/updates. Enjoy peace of mind knowing your website is secured from hackers and phishers! As a leading Perth web design studio, we offer our clients a wide range of custom web and mobile app development solutions. Perfect for sole-trader's, tradespeople, consultants and coaches looking to showcase their portfolio or services. Get ahead of the competition, land more clients, and grow your business! Additional pages can be added from just $200/ea. - 1hr of monthly website revisions/changes. - Monthly website updates and maintenance. Ideal for small to medium sized businesses who are ready to get serious about their success! Edit your own website at the click of a button! Track visitors to your website, and receive marketing insights at your fingertips! Whether you have one product, or one thousand - SunSeeker Studios deliver one-of-a-kind ecommerce solutions that get results! Manage your store, track your sales, and take control! We provide 1 hour of comprehensive training to ensure you know your store inside-out! - Website updates and maintenance. PLUS enjoy 10% off when bundled with any of our website packages! 5 quality backlinks per month from high PR, relevant directories and websites. Keep track of your user data at the click of a button! Plus we provide clear, easy to read analytics reports each month. In today's business world, rising above the crowd is incredibly difficult, but with SunSeeker on your team, you can rest assured that your brand will differentiate, and speak volumes. By thoroughly analysing your business, your core values, and your mission, we systematically craft a perfectly on-point brand identity that speaks to your business's audience, and sets you apart from the rest. PLUS enjoy 10% when booked with any of our website packages! Start reaching your customers and growing your business in 4 Easy Steps! Select the website package that best suits your needs and budget. Choose from one of our website design packages above, based on your goals, and budget. Don’t see a package that meets your exact needs? No problem -- we can build it! Simply select the “custom package” option, and provide us with some information regarding your project. We will come back to you with a package tailored to your project, along with a no obligation quote. Before we get started on your website, we like to learn more about what you do best! We find that each client has different tastes and ideas about the design efforts surrounding their brand, and we like to work with these ideas in order to create something truly memorable. During this 15-30 minute meeting, one of our experienced web design consultants will guide you through a series of questions designed to clarify your requirements, and the approach we will take to designing your website. Now, our web design wizards will work behind the scenes to bring your business’ creative vision to life. Depending on the complexity of your project, the length of time it will take to finish your website project will vary. That being said, Sun Seeker Studios prides itself on its lightning-fast turnaround times. In fact, we have the majority of our clients online in just 3 weeks or less! At this stage, our web designers are excited to show you the final design of your website which, once approved by you, will be scrutinized by our team to ensure perfect functionality. Want a few changes made? No problem! We won’t hand over anything until you are happy with every aspect of our work. Once your website is ready, our web design team will link it to the domain of your choice. We will also walk you through the process to make any future edits to your website content, via our easy-to-use website editing platform. Voila! You now have a stunning and impactful website to be used as the basis for all of your future online marketing efforts. At this point you are likely too busy managing the increased business volume that came up following the launch of your stunning new website. However, your relationship with Sun Seeker Studios doesn’t end once we hand over the website! Our web design team is dedicated to ensuring the ongoing success of your new website, and as a result, all of our hosting packages include monthly website maintenance, updates, and design adjustments. Our team remains at your disposal to make sure that you are completely satisfied with your website now, and in the future. 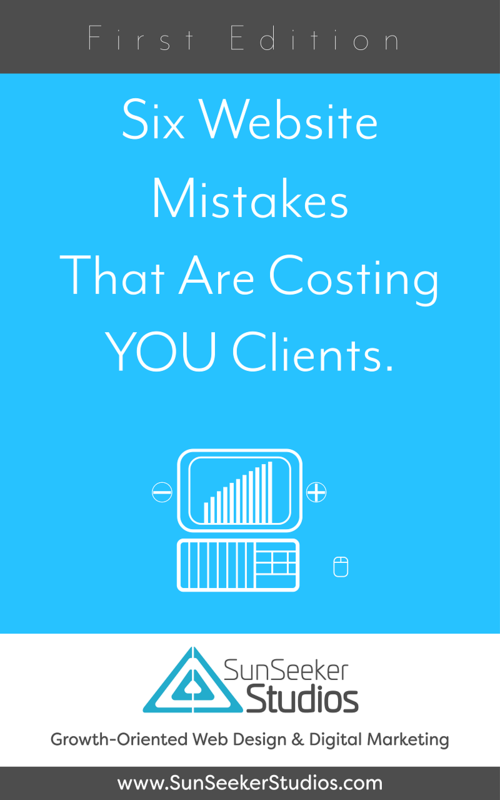 Six Common Website Mistakes that Are Costing YOU clients! We hate spam and will never send you any. Your information is protected by industry leading SSL encryption. 100% Risk-free - Unsubscribe anytime!